What goes on in Turkey? It is the task of any good tour guide to provide a clear “unbiased” look into the country for her (and his) travelers. Therefore, it is among my and my colleagues’ primary goals to help travelers understand the facts as they are, and help them to try to evaluate from the perspective of the locals. As a common practice, during all bus rides on a tour, I gather a collection national and local newspapers that represent different fractions. I read headlines to my travelers, including the different comments of the columnists. And, provide them the opportunity to decide for themselves after looking thru the kaleidoscope. Imagining the readers of this blog as the extension of the group of Rick Steves’ guides traveling now, I want to share this update about the Syrian refugees with all. I have been reading different resources and papers, and observing about the Syrian refugees, in sum, I can say we are confused. “36,000 babies were born in the refugee camps within the past year”, said the Turkish Prime Minister Davudoglu few days ago. Realizing that total number of babies born is about 60,000 in the past three years and almost 2 million Syrian refugees are in Turkey now. Few well to do refugees already established businesses and themselves happily thru Turkey, majority of them being in southeast. Those who are not as lucky take chances, leave camps and seek for job opportunities, or stretch a hand asking for help. Lately, my Cappadocian friend, a small-scale entrepreneur was penalized for employing refugees as they don’t have work permits. He says, “I don’t have enough money to help them all, but I can employ them.” This is where it gets complicated, we can’t employ them legally, begging is illegal –and looked down upon-, yet they are human beings who need to eat and feed their children. There are regular campaigns of various NGO’s working had to support the refugees, however number of people needing help is staggering and beyond what local civil attempts can reach. Our heart goes for them. A report of Amnesty International I read, and Rick Steves’ call for “Share your plate challenge” I watched in his blog lead me to share these with you. 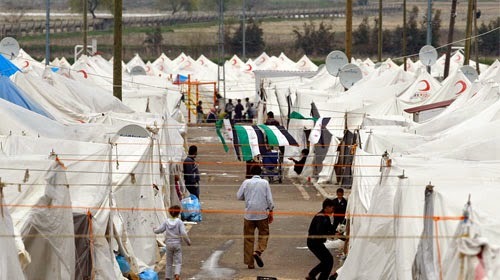 According to AI 3.8 million refugees are hosted in five countries, these are: Turkey, Lebanon, Jordan, Iraq, an Egypt. And, only 1.7% of this number was offered shelter by the rest of the world! Yet medallion has another side too, there is a fair resentment among the needy locals and un-employed as refugees seem to have taken their place for receiving the help and sympathy. The reports about refugee camps are also puzzling. They are said to be the best ever built in Turkey so far with laundry opportunities, schools for the children, career education courses. According to some journalists not all camp dwellers are those who tried to get away from Esad, they came as a better life was promised to them. It is known that refugees in camps are furnished with cash cards that give them a certain allowance for their expenses. If true, why do they leave camps and beg on the streets?! According to Secretary of Finance, Mr. Mehmet Şimşek, a total of 4.5 billion dollars has been spent for the refugees for the past 3 years as of November 2014. This makes over USD 2,000 per refugee in a basic calculation, considering the number of the refugees sum up to 2 million. Another fact is the professional beggars disguised as Syrian refugees abusing the good will of hardworking individuals. PS: I had the privilege to travel to Syria for a number of times in the past, both personally and professionally. My trips included leading tours for American travelers. Now, I am sad seeing the situation of a very hospitable and proud nation, and amazing historic and cultural monuments disappear fast. Some of these monuments and souks don’t extist anymore. Photo by Tankut Aran. Ummayyad Mosque in Damascus is a ruin now. Photo by Tankut Aran. Me and my husband Tankut with our older son in my tummy, Palmyra ancient city in Syria. Phot by Mary Ann Cameron. Our group of American travelers in a easy side trip to Baalbek from Syria. Photo by Lale Surrmen Aran. Baalbek in Lebanon, easy side trip from Syria (at least, back in 2006). Photo by Lale Su¦êrmen Aran.